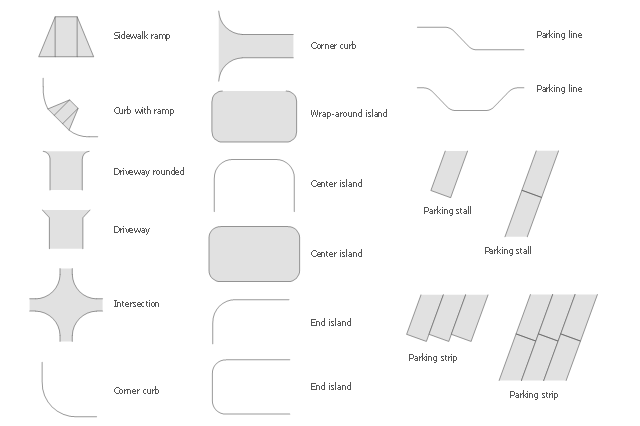 The vector stencils library Parking and roads contains 18 symbols of parking lots and strips, parking spaces, driveways, street junctions, and interchanges for parking facilities, on-street and off-street parking, and traffic management. "A parking space is a location that is designated for parking, either paved or unpaved. Use the design elements library Parking and roads to draw residential and commercial landscape design, parks planning, yard layouts, plat maps, outdoor recreational facilities, and irrigation systems using the ConceptDraw PRO diagramming and vector drawing software.